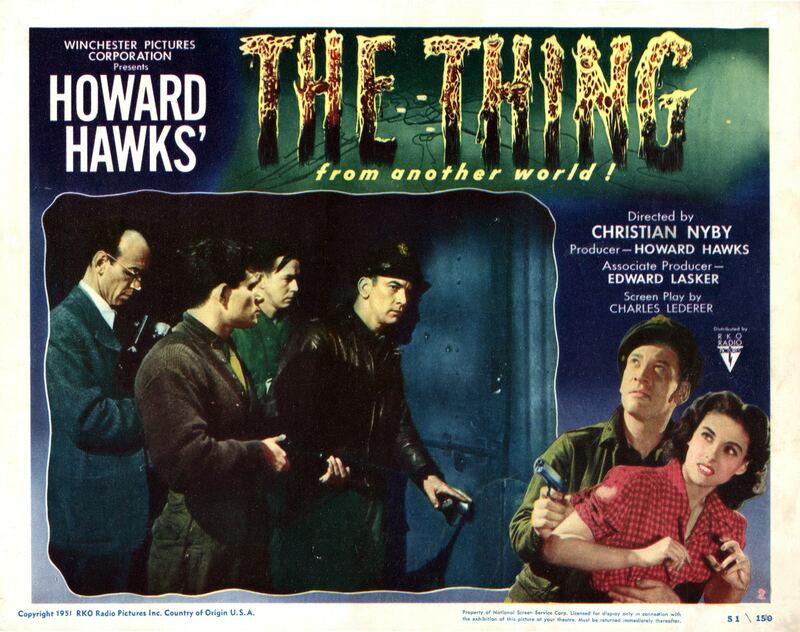 The Thing From Another World is a story of an Air Force crew (with a lone newsman (Douglas Spencer) tagging along) is ordered to fly up to a remote base in the North Pole to investigate reports of a mysterious aircraft crash. Led by Captain Hendry (Kenneth Tobey), the crew is greeted by a chilling Arctic air, which serves as an omen of “things” to come. The base also serves as an outpost for Polar Expedition #6 where a group of scientist has assembled for a convention. After examining the information available, head scientist Dr. Carrington (Robert Carthwaite) surmise that this craft it is not of this world and with the help of the good Captain decide to lead an expedition out to the crash site. Upon arriving at the crash site, their assumptions prove to be correct. The saucer now lies under tons of ice. Captain Hendry orders his crew to plant thermite bombs around the circumference of the ship to help melt away the ice. After a series of explosions and a large fireball presumably from the engine of the craft, everyone fears that they have lost one of the greatest finds in the history of man, but when examining the wreckage, they notice what appears to be a person or in this case, the pilot buried in the ice below. With axes in hand, the crew carefully removes a block of ice that now serves as a tomb for the visitor and decides to take it back for further investigation. Back at the base, Hendry decides to keep the creature frozen until he receives orders on what to do otherwise. He places it under guard in a storage room. This is met with furious disdained from the scientist especially Dr. Carrington who demands his right to examining the creature. Hendrey calmly explains that this is no longer a civilian mission, but rather a military operation now. This causes the scientist to quickly scurry back to the confines of their lab so that they may plot a way to circumvent Hendrey’s authority and make first contact. As the creature lies apparently dormant, a strange eeriness can be felt as the guard unknowingly puts a blanket on and places a space heater near the block of ice. Before you know it, we find the guard semiconscious and The Thing having escaped to being its reign of terror. The Thing From Another World begins a classic clash between the military and the scientist. This has been a reoccurring theme in many films of this type. On one hand, you have the military wanting to destroy the beast to protect mankind and on the other hand, you have the scientist who wants to capture and study the creature. This is one of those rare occasions in sci-fi/horror film history, where the military is actually the level headed side of this equation. It isn’t to later that we find out that this “highly intellectual carrot”, as it is called, has a need for blood. Guess who’s coming for dinner??? The battle continues until the end comes with Scotty declaring across the airwaves, “watch the skies”. Another controversy at the time actually came out of the sci-fi community. A few people were not happy with how Hawks changed the creature. In Campbell’s novella and accurately recreated in John Carpenter’s “The Thing“, the alien would use it’s the ability to shape-shift in an attempt to defeat it’s the newest enemy. 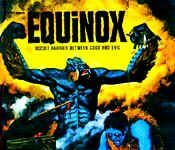 Hawks decided to only show a quick glimpse of the creature until the end and when he did, it turns out to be a man in a jumpsuit with makeup on his face (James Arness). Again, for me, the film works either way. If you want to see the story in a truly special effects extravaganza, then see John Carpenter’s “The Thing“, but don’t let that stop you from seeing this great film like The Thing From Another World.